Jazan/Bonn, 22 November 2012 - The first meeting of the AEWA Northern Bald Ibis International Working Group (AEWA NBI IWG) took place from 19 to 22 November 2012 in Jazan, Saudi Arabia and was hosted and sponsored by the Saudi Wildlife Authority and Jazan University, with further financial support from BirdLife International and the Royal Society for the Protection of Birds (RSPB – BirdLife UK). The AEWA Northern Bald Ibis International Working Group (AEWA NBI IWG) was convened two years ago. Its goal is to facilitate and coordinate the implementation of the AEWA International Single Species Action Plan (SSAP) for the species, which was originally approved by the 3rd Meeting of the Parties to AEWA (MOP3) in 2005. The coordination of the IWG is provided by BirdLife International under a Memorandum of Cooperation with the UNEP/AEWA Secretariat through a unit of a coordinator from the RSPB and assistant coordinators for the Western population from SEO/BirdLife (BirdLife partner in Spain) and the Eastern population from the BirdLife Middle East Secretariat. 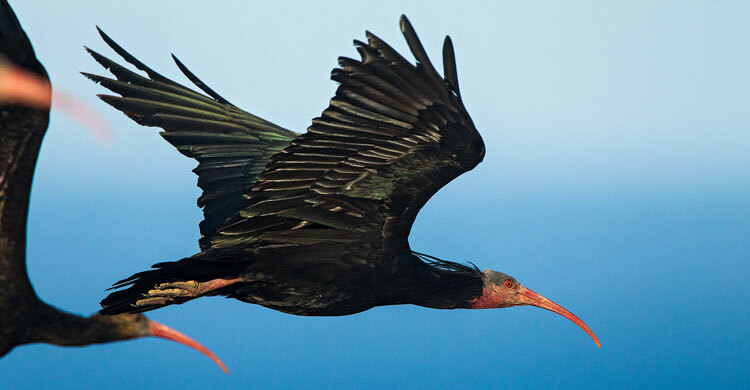 The Northern Bald Ibis is a Critically Endangered species with two small wild populations restricted to a very limited breeding range. The Eastern population, breeding in Syria, reached a critical number of four birds in 2012 after a decline from 13 birds at the time of its re-discovery in 2002. It migrates along the Arabian Peninsula to its breeding area in Ethiopia. The Western population estimated at ca. 500 birds of which ca.110 are nesting pairs, breeds in Morocco and is dispersing in the non-breeding season. A semi-wild population of ca. 150 birds is kept in Birecik (Turkey) and experimental reintroduction trials have been undertaken in Spain and Austria/Germany/Italy. The meeting was attended by 23 participants representing four of the seven member range states (Morocco, Saudi Arabia, Turkey and Yemen) and two of the observer range states (Algeria and Spain) as well as including observers from the International Group on the Northern Bald Ibis (IAGNBI), the BirdLife coordination unit and the UNEP/AEWA Secretariat. The meeting had ambitious objectives all of which were successfully achieved. The major outcome of the meeting is the initiated revision of the SSAP. The entire action framework was revisited and streamlined on the basis of re-run problem analysis, which was facilitated by the Secretariat. The country reports delivered by the attending range states were a useful background to these discussions. The newly formulated actions were further prioritised by each member and observer range state at national level and the research and monitoring activities at sub-regional level, followed by more detailed identification of activities to be implemented in the next three years before the 2nd meeting of the IWG, which is to take place in 2015. The draft of the revised SSAP will be compiled early next year and submitted to the 9th Meeting of the AEWA Standing Committee in late 2013 for approval on a temporary basis before sign off by the 6th Meeting of the Parties to AEWA (MOP6) in 2015. The meeting further decided to establish a list of critical sites for the species under the AEWA NBI IWG, which will be a rolling list identified and maintained by each range state. Regarding the institutional arrangements, the meeting approved the Terms of Reference for the NBI IWG, elected its chair – Saudi Arabia, confirmed IAGNBI as an observer to the IWG and decided on its reporting practices and funding issues. On the last day, the hosts offered a field visit to the area in the extreme south west of Saudi Arabia around Jazan Wadi Dam where the Northern Bald Ibises of the Eastern population stop-over during their migration southwards to wintering grounds in Ethiopia, which rounded up this successful meeting most interestingly.